By the time you read this, our brief summer will be coming to an end. By early August, the leaves on many tundra shrubs and bushes already turn golden. By the end of the month, chances are we’ll have seen a few nights below freezing. It’s a busy period, as we batten everything down for the long winter ahead. We take this time to thank you most sincerely for your faithful support for our work, both by finance and by prayer. You remain in our prayers every day. Thank you! 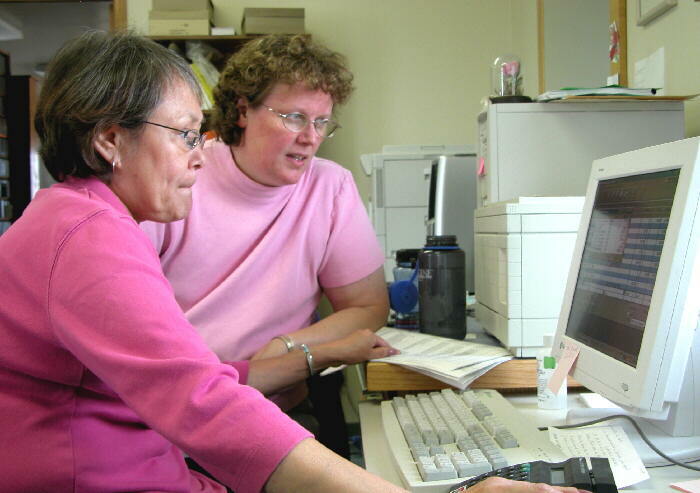 ASSETS (left): From left, Florence Busch and Lynette Schmidt carefully check KNOM’s list of assets as they close out the old fiscal year in July. If you write KNOM a note or send a contribution, it’s one of these women who will be opening your envelope. Florence was a volunteer for the station in 1975-76; Lynette between 1982 and 1985. RECENTLY SPOTTED: In addition to broadcasting 34,000 inspirational spots every year, KNOM airs 34,000 educational ones that treat a variety of important subjects. Educational spots this past month dealt with childhood asthma, alcoholism, helping students, safe bicycling, diabetes, identity theft, Alaska science, history, tobacco, parenting, diet, heart disease, cocaine, domestic violence, victims’ rights, kitchen safety, Alcoholics Anonymous and Alanon, native culture, blindness and personal responsibility, among others. Thank you for making these frequent broadcasts possible. TOWERING ISSUES: Former KNOM’er Les Brown visited Nome from California in July and thoroughly checked our transmitting tower, its guy wires, anchors and base, and pronounced the 34-year-old structure still healthy, thanks to vigilant preventive maintenance over the years. Eternal life is not what happens after we die. Eternal life is what happens when we start to live as a son or daughter of God. It begins the moment we hear and follow Jesus’ voice. And because Jesus is the One who has defeated death, those who follow Jesus’ voice will walk right through death like an open doorway. 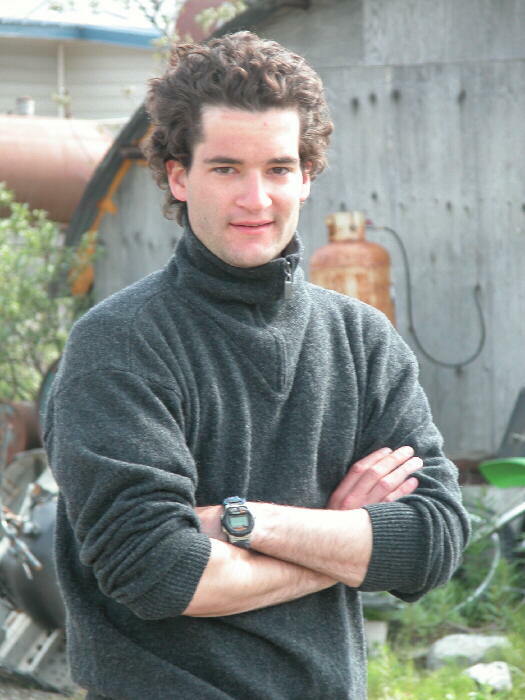 MINE, ALL MINE: In July, KNOM volunteer Clinton White (below) flew 250 miles north of Nome, the last hundred above the Arctic Circle, to visit the Red Dog Zinc Mine. Tucked away in a remote corner of northwest Alaska, it’s the world’s largest zinc mine, and is believed to hold the largest deposit of the metal in the world. Over three days, Clinton recorded 4-1/2 hours of interviews, which he distilled into four daily programs. Of course, mine operators were hoping to soften Clinton’s coverage of them. That didn’t stop Clinton, a thorough professional, from asking tough questions. 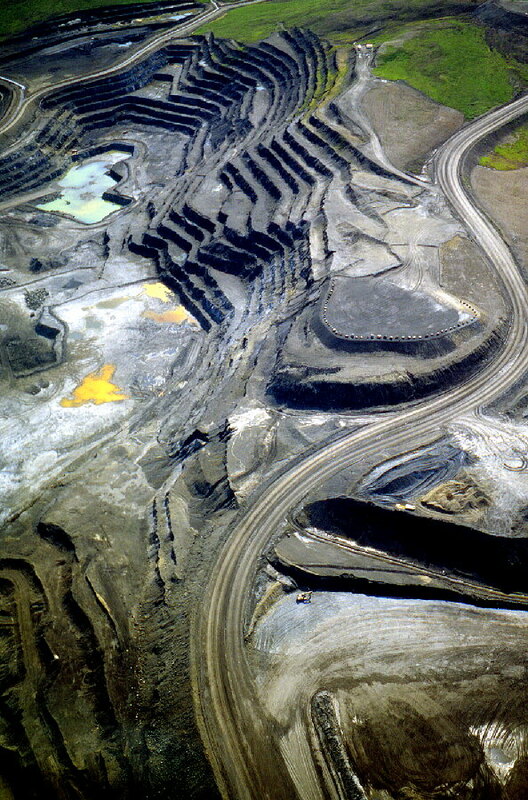 (Left) Clinton snapped this image of the Red Dog Mine from the air. In the flat area in the lower right, you can see an excavator, which gives you some idea of the immensity of the mine. GOODBYES: Summer is when most volunteer terms end, and when we suffer the pain of farewells. In July, we bid goodbye to Emily Barrett and Julia Dunlap, who both depart the mission after two excellent years of service. Emily has supervised the recording and scheduling of KNOM’s spots, while Julia has worked as deputy news director. We hope to see Julia again, as she intends to eventually return to Alaska. Emily, meanwhile, is remaining in Nome, so we’ll enjoy her infectious smile for some time to come. Please continue to pray for these wonderful young women, won’t you? “WEATHER” OR NOT: While June brought one brief warm day, July settled into more normal high temperatures, mostly in the 50’s, with wind chills in the 40’s. July 7th, program director Ric Schmidt overheard a 77-year-old Inupiat Eskimo man, who sniffed the cool air, peered at the grey skies and the ashen Bering Sea and muttered to himself. Please consider adding missions like KNOM to your will. For many of us, it will be the largest gift we ever make. At KNOM, we place all such gifts into funds that provide for future major improvements and protect the mission against unforeseen emergencies. Peace is a daily, a weekly, a monthly process. Gradually changing opinions, slowly eroding old barriers, quietly building new structures. And no matter how undramatic that pursuit of peace may be, it must go on. MEET BRAND NEW KNOM VOLUNTEER LIZ RECCHIA (left): A 2004 graduate of Valparaiso University with a degree in public relations, Liz joined KNOM on July 1st. 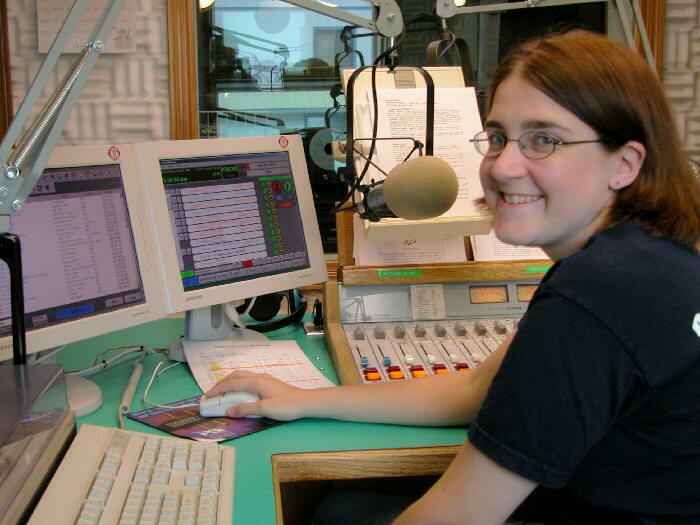 Within a couple of days, she was already on the air: this photo was taken during her first solo shift. “I’m really excited about my job,” Liz says, although “it’s strange looking out and not seeing trees or grass. Still, I adjusted sooner than I thought I would. In her spare time, Liz enjoys many kinds of athletics, including running. “And I like traveling and trying things that I’ve never done before,” she says. Welcome, Liz! SMOKE GETS IN YOUR ICE: (left) You may have read about the immense tundra fires in the northeastern part of Alaska, sparked by lightning. In Fairbanks 525 miles east of Nome, visibility dropped to � mile for days. A few villages in KNOM’s listening area saw visibilities that low, but in Nome, it remained a little better. 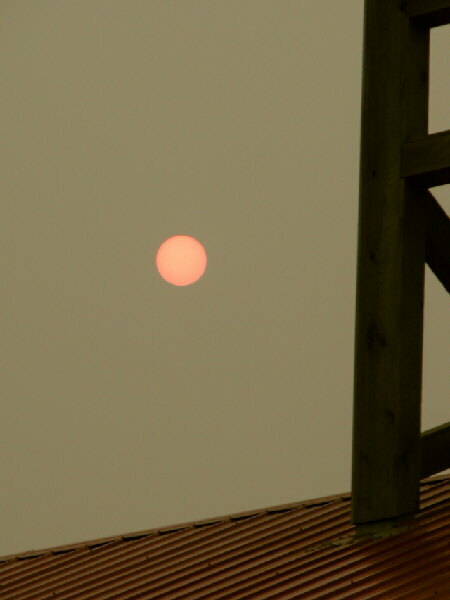 For us, the worst was a sky that looked like mud, which a dim red noontime sun barely penetrated. This image was taken by Nome's St. Joseph Church, a block north of KNOM. SERIOUS BUSINESS: Several of our friends have asked us to publish information on the allegations against KNOM founder Fr. Jim Poole, SJ, who now lives in Spokane, Washington. At this time, three women have filed formal charges with the Diocese of Fairbanks, claiming sexual abuse when they were children. We are told that a few more have come forward but are not seeking money. We have posted complete texts of the complaints available to us at www.knom.org/pooleinfo.html. It’s important to note that KNOM is not named in any lawsuits, and no contributions to KNOM will be used to fund settlements. We continue to pray for everyone involved. Thank you for your prayers! INSPIRATIONAL SPOT: Our concern should not be whether God is on our side, but whether we’re on God’s side. Because God is always right. The brokenhearted. The joyful. The distracted. The peaceful. Those with heavy burdens. The carefree. We are all invited to find our way back to our imperfect congregations, the faith families our brother Jesus so much wants to gather. Jesus, the Bread of Life, is calling you to a holy feast with your brothers and sisters. INSPIRATIONAL SPOT: The one thing that does not abide by majority rule is a person’s conscience. One person with courage and conscience makes a majority. THIRTY YEARS AGO: In August 1974 the “Nome Static” joked that KNOM was trying to take over the Alaska broadcasting industry, noting that only three years after KNOM debuted, five former volunteers had already moved on to employment in radio around the state. That month, a 45-foot long grey whale washed up on the beach near Nome, creating something of an aroma problem. It was no time at all before dog team owners were cutting away hundreds of pounds of meat and storing it for the winter. 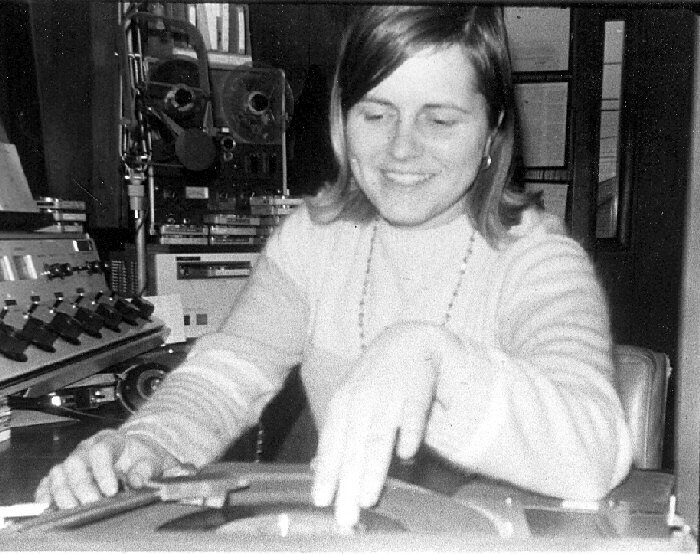 ON CUE (left): In 1974, KNOM volunteer Jeanne Gabriel cues a 45 RPM record in Studio A as she deejays her popular afternoon program. Jeanne’s signature line on the radio was “happy, happy, happy!” She dedicated two years to KNOM service. Today, she lives with her husband and their three daughters in Helena, Montana. Since 1966, approximately 300 generous people like Jeanne have devoted a year or more of their lives to serving others by volunteering for KNOM. FROM ON HIGH: A few weeks ago, FCC Commissioner Kathleen Abernathy was touring Alaska. The state broadcasters association sponsored a dinner with Mrs. Abernathy, and KNOM general manager Tom Busch cashed in some airline miles to fly to Anchorage for the event to discuss our village translator projects. Commissioner Abernathy agreed that providing remote villages their first educational radio service is important, and offered her help. Some time later, an FCC staff engineer called Tom from Washington, D.C. He had reviewed our applications, and judged that they would all be easily approved. When? Nobody can say, as the Commission moves very slowly. ALL’S FAIR: In July, volunteer Julia Dunlap flew north to the town of Kotzebue to cover an event commemorating historic trade fairs. Before the spot was permanently settled in 1897, Eskimo groups would boat in from all directions � including from Russia � during summers, to trade items and supplies that were available in their different regions. Again, we thank you for your generosity to our mission work, and for your prayers. Our work continues because of your kindness. While this frontier radio station is among the most award-winning stations in the United States, our greatest reward is the loyalty of our thousands of devoted listeners, and the friendship and concern of good people like you. We begin each weekly staff meeting with a fervent prayer for our benefactors, and you remain in our personal daily prayers, too. God bless you!